"We Refinish Bathtubs & Tile"
Is your bathtub or tile an ugly color, caked with grime, or damaged? Our team at AAA Tub N Tile can help. 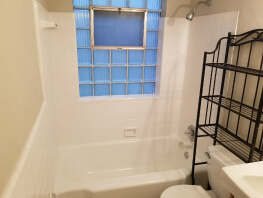 Why spend tons of money tearing out an old bathtub, shower, or tile when you can have it refinished for a fraction of the cost? 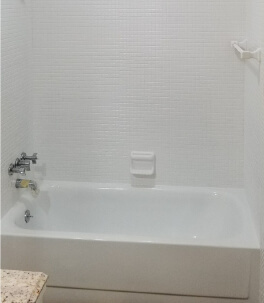 Our team specializes in reglazing and refinishing bathtubs, bathtub surrounds, showers, and kitchen tile. With our custom refinishing services you can make the surfaces in your kitchen and bathroom look like new again. Our refinishing technique can repair discoloration, scratches, or other damage that naturally occurs over time. In addition to this, we are able to change the color of the existing tile or bathtub if it is undesirable. In addition, reglazing for bathtubs is not just for damage and discoloration. We specialize in providing durable wear-resistant coatings that can make your antique bathtub look like new and last much longer. Our team is trained to handle refinishing jobs large or small, whether you are a homeowner simply looking to refinish the tile surround in your bathroom, or a hotel or other business with a large number of bathtubs that need to be reglazed. If you have noticed discoloration, chipping, or cracking in your bathtub or tile don't hesitate to contact our experts. Bathroom and kitchen surfaces face a lot of wear and tear over the years, and as these surfaces age they become prone to staining, cracking, and other forms of damage. Often times this damage can be fixed quickly, but in most cases, if your tile is older than 15 years old it may require more work. Our process for reglazing and refinishing tile is easy and can help you restore your bathroom or kitchen tile cheaper than other alternatives. 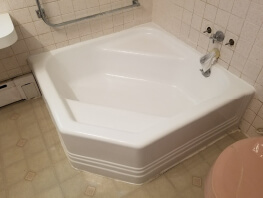 This is also true for bathtubs where your options are often to tear out and replace the old tub or to spend a lot of money on having a custom cover created for the bathtub. The issue with these two options is that they are both very expensive. 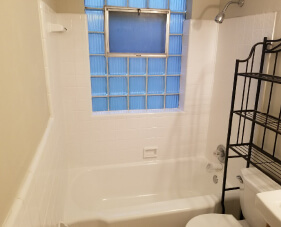 Our tile and bathtub refinishing services are cheaper and more applicable in situations where you either don't want to replace the existing tub or the tub may be an antique that you wish to preserve. 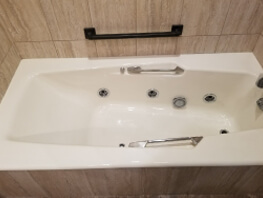 Our bathtub and tile refinishing services are available for bathtubs, bathtub surrounds, clawfoot bathtubs, shower surrounds, kitchen backsplashes and most other types of tile in your home. Our team at AAA Tub N Tile is proud to offer our professional bathtub and tile refinishing services to several communities across St. Louis and Illinois. We know that for many homeowners the decision to refinish your bathtub or tile can be difficult. In order to combat this, and to provide more homeowners with a cost-effective solution for tile and tub reglazing, we cover a wide variety of counties in St. Louis and Illinois including Jefferson, St. Charles St. Louis, St. Louis City, St. Clair, and Monroe counties. 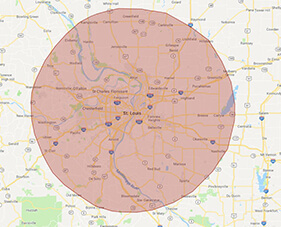 Click the button below to check out our full service area map and the cities we service.